Formed in one piece with an almond-shaped crown rising to a short stalk at its apex, and an integral brim turned down at each side and rising to a prominent point at the front and rear; the base of the crown encircled by a row of brass-capped iron lining-rivets retaining decorative rosette washers of brass beneath their heads, and fitted at the rear with a large leaf-shaped plume-holder of brass decorated with scrolled edges and punched ornament, and retained, by two brass-capped iron rivets; the edge of the brim decorated with a file-roped inward turn accompanied by a narrow recessed border; and decorated overall with finely etched ornament, partly gilt and partly bright on a stippled ground which is partly blackened and partly gilt, comprising on the crown, four panels of trophies of arms, the front left one involving a winged and crowned female figure representing Victory, separated by medial and lateral bands of interlace and oval cartouches enclosing classical and contemporary warriors, and on the brim and in a band around the base of the crown, stylized acanthus foliage. 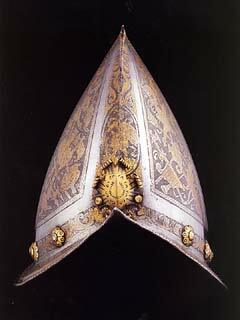 This particularly elegant form of morion, characterized by an almond-shaped crown rising to a short, backward-pointing stalk at its apex, was referred to in late 16th century English texts as a 'Spanish' morion, and in French texts, as a cabasset. Although there can be little doubt, as its name implies, that this kind of morion was ultimately derived from the Spanish cabacete or kettle-hat of the 15th century, its principal producers in the latter part of the following century were the renowned armourers of the North Italian city of Milan, who typically provided it as part of the half-armour or 'corslet' of the infantryman. Finer versions of this type of armour were made for wear by officers, whose equipment would have been of the same kind as that of the troops that they commanded, but of a quality that reflected their rank. Very often they were provided as parts of 'garnitures' of matching pieces that could be variously assembled to meet the differing needs of war and the tournament. The exceptionally handsome helmet shown here formed part of such a garniture: probably that of the noted Milanese soldier and diplomat, Renato Borromeo. The finely executed bands of etched, gilt and blackened interlace and cartouches that form a conspicuous element of the decoration of this important helmet are of a kind recorded on the products of several leading Milanese armourers of the late 16th century, including one who signed himself with the initials IFF on a half-armour now in the Art Institute of Chicago (Ace. No. 1982.2194), and another who signed himself with a triple-towered castle on a visor and bevor in the same collection (Ace. No. 1982.2493). Such bands, however, are a particular feature of the works of Pompeo della Chiesa (recorded 1571-93), unquestionably the most distinguished Milanese armourer of his time. They can be found, for example, on a signed half-armour of Henry Herbert, 2nd Earl of Pembroke, at Wilton House, Wilton, where they appear alone. More typically, however, they appear, as on the present helmet, in association with intervening panels of trophies. 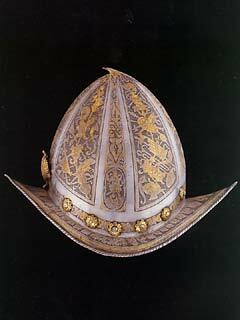 Pompeo's signed works showing this kind of ornament include a cap-à-pie armour in the Museo Stibbert, Florence (Inv. No. 3476), a half-armour in the Philadelphia Museum of Art (Cat. No. 32), and a further half-armour in the armoury of the Knights of St John at Malta (Cat. No. 91), of which the collar is now in the Royal Armouries Museum, Leeds (Inv. No. III. 4685), and the close helmet--an alternative headpiece to the 'Spanish' morion mounted with the armour in Malta--is in the Metropolitan Museum of Art, New York (Ace. No. 14.25.656). The armour in the Museo Stibbert is composed of the disparate elements of a garniture for heavy cavalry, infantry and probably tournament use, but lacks a helmet. It can be readily distinguished from other recorded armours of its group by the design of the borders--namely a narrow band of guilloche within a broader plain band--that enclose its panels of trophies. 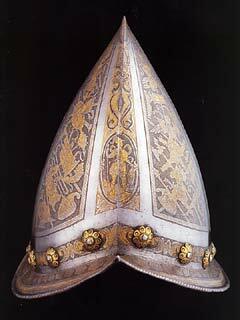 Bands of exactly the same design occur on a close helmet in the Museo Poldi Pezzoli, Milan (Inv. No. 2592), and the morion shown here. It seems not unreasonable to conclude in these circumstances, that these two headpieces respectively represent the missing heavy field and light field helmets of this important garniture. The decoration of the elements preserved in the Museo Stibbert includes devices of the Milanese family of Borromeo di San Miniato: probably relating to Renato Borromeo who became a captain of men-at-arms in 1591, Milanese ambassador to the court of Philip III of Spain in 1598, a member of the Secret Council in 1601, and died in 1608. In 1579 he married Ersilia Farnese, natural daughter of Ottavio, Duke of Parma, and therefore sister to Alessandro Farnese, one of Pompeo della Chiesa's greatest patrons. The earliest evidence of Pompeo's activities as an armourer dates from 11th October 1571 when he wrote to Emmanuel-Philibert, Duke of Savoy, to discuss an armour that he was then preparing for him. In 1585 the Milanese dealer Giovanni Antonio Perego paid him for twelve morions and round targets that were to be sent to Seville. Pompeo apparently lived and worked in the Castello Sforzesco in Milan, and by 1592 held a court appointment to Philip II of Spain, who was also Duke of Milan. He is last mentioned in 1593 when he was paid the balance due on an armour made by him for Alessandro, Duke of Parma, who had died in the previous year. Among Pompeo's other distinguished patrons can be mentioned, in addition to those already referred to above, Vincenzo I Gonzaga, Duke of Mantua, Francesco I dei Medici, Juan Fernandez Pachecho, Duke of Escalona, and the Dukes of Infantado. A fine half armour by Pompeo was included in our 1996 catalogue (No.2) which is now in the Cleveland Museum of Art. The armour garniture made by him for Renato Borromeo has been dated by most authorities within the period 1580-90. The high crown and 'swept' brim of the morion shown here, contrasting with the somewhat lower crowns and slightly downturned, narrow brims of the morions associated with Pompeo's later armours, suggest that the garniture to which it belongs can be counted among his earliest extant works. This morion therefore constitutes an important as well as attractive addition to the known corpus of evidence relating to the repertoire of this outstandingly gifted Milanese armourer. Sorry I didn't notice this one when it went by! I guess I was eating too much turkey at the time or something. Anyway, great Morion-Cabasset! Thanks!